A new baccalaureate exam will be introduced at the 2021 session. In the first year of upper secondary school (seconde), all students are taught general classes (23,5 hours a week): French, History and Geography, two modern languages (the second modern language is compulsory for all pupils), Mathematics, Physics and Chemistry, Earth and Life Sciences, Physical education and sports, and Moral and civic education. These classes work to prepare the student for their final two years of upper secondary school, as well as ensuring the transmission of the values and skills of the Common Core of Knowledge, Skills, and Culture. artistic courses (artistic creation and activities). Furthermore, complementary lessons could be proposed to voluntary students. These choices do not predetermine a student's route for the last two years of upper secondary. 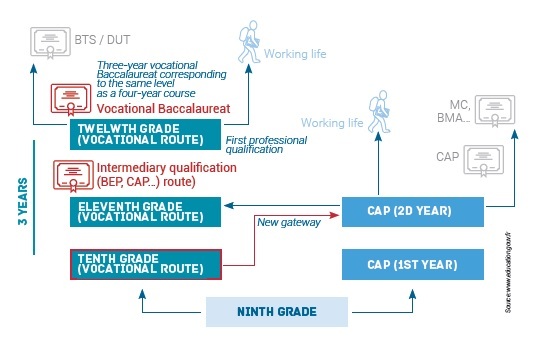 After their first year (seconde) of upper secondary school is complete, students can choose to follow one of two paths for the baccalaureate: general or technological. They enter the "cycle terminal", or final cycle of schooling, for their last two years - première (lower sixth) and terminale (upper sixth). Students who choose to take the general baccalaureate work towards extended study after upper secondary school, likely in university. Students who selected the technological route favours the continuation of higher technological study, mainly in technical careers (over two years) and, beyond, towards vocational bachelors and masters or engineering studies. Students choose their specialisations gradually in a general or technological route for the final two years of upper secondary school. At the end of their last year, pupils sit for the baccalauréat exam. If they pass, they receive their first higher education diploma, which entitles the holder to enter the first year of university study. The baccalaureat is composed of several sections, some of which are taken in the previous year, such as written papers or oral defence projects in French. With the general baccalaureate route, students take classes centered around three series: literature - French and literature, modern languages, and philosophy; economics and social sciences - economics, history and geography, mathematics; and science - mathematics and experimental science. The goal is to prepare pupils for higher education after completing secondary school. In Première, the classes on these three series often include teachings common to each as well as general knowledge essential to the understanding of the modern world (French, modern language 1 and 2, moral and civic education, physical education and sport). They also include specific classes for each series which enable a specialization to be initiated, which will be more strongly marked in the final year in the perspective of higher education and the pupil's future academics. Students commence supervised personalised projects on a theme chosen by the student which will be eventually evaluated as part of their baccalaureate exam in the form of an oral defense. Some courses are also subject to an advanced examination in the baccalaureate: French, the supervised personal project, sciences (only in the literature and economic/social series). In Terminale, teachings common to the three series of literature, economic and social sciences, and science are also taught. They include both modern languages, physical education and sports, and moral and civic education. Specialty courses account for most of the students' time in school. They are focused specifically around the chosen series of the student to specialize in - examples include: law and major issues of the contemporary world (literature series), computer science and digital sciences (science series), or social and political sciences (economic and social science series). Students are also given the choice of two optional courses of art or physical education and sports, to be taken alongside their technological classes if they so choose. Also similar to the general route, some courses are subjected to an advanced test at the baccalauréat: French and history and geography (series STI2D, STL, STD2A). In Première, the Science and Technology of Industry and Sustainable Development (STI2D) and Laboratory Science and Technology (STL) series include an important common core similar to the general series which features French, History and Geography, 2 Modern languages, Mathematics, Physics and Chemistry, Physical education and sports; transversal technological lessons that promote versatility; and an education specific to technology which allows each student to deepen study in an area of their choosing. There is a third route which allows pupils to gain vocational skills as well as general knowledge specific to a given field. This track was reformed in 2009 to help raise the qualifications of young people, improve their transition from school to a professional environment, and facilitate further study in higher education when relevant. In the lycée professionnel, pupils attend seconde to prepare for a baccalauréat professionnel over three years or a first year leading to the certificat d'aptitude professionnelle (CAP) over two years. Young people can also work towards their vocational diploma through an apprenticeship at a Centre de Formation d'Apprentis (CFA) (Apprentice Training Centres) and day release to an employer. They have the status of young private sector employee and report to a head tutor, or can choose to work in the public sector.  Le brevet des métiers d'art (BMA: arts vocational qualification): level IV, 2 years after a CAP in the vocational arts, 26 specialisms. A vocational degree can also be prepared within the framework of an apprenticeship that alternates classroom work in an apprentice training center (CFA) and experience in a company. The apprentices have then the status of young worker and are under the responsability of a supervisor. They can also be welcomed into public service. For more information about vocational training and its impact in France, click here.